Ubisoft's team was on a narrow cliff-side path when the attack came. It was a common setting for Nepal -- a strip of road with a sheer slope on one side and a drop on the other. Their drone buzzed out into the abyss, capturing footage of a river in the valley below. That's when the eagle attacked the drone. Nepali eagles are used to people, and birds, and the occasional helicopter, but they'd never encountered drones before. The sudden assault became a moment familiar to anyone who's played Far Cry 4. "The most important thing we brought back from our trip to Nepal are not pictures, videos or notes," said Phil Fournier, Far Cry 4's Production Manager. "It's the anecdotes and experiences that we lived through while being there that helped us shape Kyrat into a believable place." Indeed, having recently returned from Nepal myself, I can attest that Ubisoft achieved a stunning level of fidelity with Far Cry 4's environments. The game's landscape and architecture invoke the Himalayas with every crooked stone path and glacier-capped mountain. But it's not an accurate representation so much as an impressionistic one, a theater that looks like the Himalayas but still accommodates the Far Cry model of play. It's an effect that required monumental research and a personal visit, and produced one of the most impressive virtual environments ever. The Himalayas are not a simple landscape to translate into a game. In lower altitudes like those South Kyrat depicts, the scenery's more pastoral and jungle-clad than the snowy peaks we associate with the country. It's a fertile region where trails wind past little hamlets and rice terraces cut into the steep slopes. The land's a vibrant green like a St. Patrick's Day streamer, the same green as on the prayer flags villagers string along the path. Clear rivers -- the product of glacial melt -- cut through the valley floors and waterfalls tumble from above, spill across the path, and then fall below you like a stepped fountain. The footpaths are "Nepali Flat," meaning any angle up to 45 degrees and often steeper. Nepalis consider anything that isn't stairs to be flat. Trekking the Himalayas means hugging the curves and undulations of the mountains. You're forever hiking up to go down, and down to go up. Dirt paths give way to uneven stone as you approach villages. 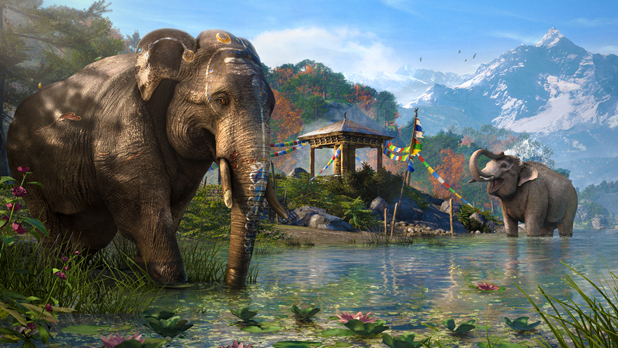 It's a good example of how Far Cry 4 captures the region's spirit, but also changes it to serve its own purposes. The game includes all of these visuals in its breathtaking landscapes, and to an extent replicates the feel of traveling by foot, but it's also been altered to reflect Far Cry's game mechanics. 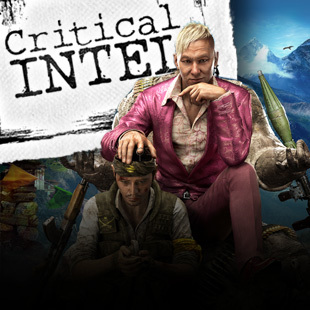 This game has more verticality than any Far Cry to date, but the cliffs aren't as steep, the terrain as rugged, nor the vegetation as thick as the real thing. It turns out that "Nepali Flat" doesn't make for a very good player experience, and the team had to balance the alpine environment with gameplay concerns. "Our first iteration [of] Kyrat had long inclined roads with few flat areas, which felt good visually," Fournier said. "[But] after only a few minutes of driving around, the world felt contrived and didn't give us the sense of freedom or scale we were looking for." Indeed, it'd be difficult to drive around the Himalayas at all. Most mountain villages like the ones in Far Cry 4 can't be accessed by car. All the supplies come in via porters packing it in on their backs, or on horse or mule trains. Trek there and you'll encounter these unwieldy caravans -- one horse passed me so close, its haunches squeezed my face into a moss-covered cliff. The environment can't support mountain bikes, much less cars. The team settled on more moderate topography. Less "Nepali Flat" and more like the rice terraces that dot the region. "We decided to break it up into multiple gameplay areas where interesting locations could be approached in all sorts of ways," Fournier said. This solution provided the best of both worlds -- retaining the illusion of dizzying altitude while stabilizing the play area. In addition, the more gradual valleys allow players to directly ascend and descend using the grappling hook, something that would be impossible on realistic cliff faces. But despite scaling down and flattening the valleys, the world still maintains a sense of epic scale -- in fact, wide valleys and stepped mountains create longer sightlines than Nepal normally allows. The other new transportation tool, the gyrocopter, also serves to show off the emerald vistas.